The street style Malaysian (Malaysian Indian Chicken Curry & Malaysian Indian Chicken Curry) Fried Mee and the Chinese style fried yellow noodles. Of course, obviously, you have a choice, like I have already told you, for a plate of Malaysian Fried Mee at hawkers stalls, Then again, nothing like home made right? We opting for the ingredients we like in fried mee and my this version is primarily seafood (Tom Yam Fried Mee Hoon & Home Made Curry Mee). You definitely have the liberty to adding pork or chicken, but I kept it to seafood for a halal version. 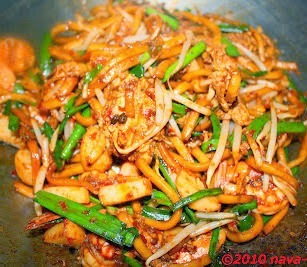 Malaysian Style Fried Mee. Yellow noodles, prawns, fish balls, fish balls, beansprouts, chives, soy sauce, of course we need chillies. Tastiness. Sumptuousness. Delightfullness. In heated oil, saute garlic. Add chilli paste and prawns and continue to fry for 2 to 3 minutes. Add mee, dark sauce, light sauce and salt. Stir and then push mee aside. Break eggs in the centre. Fold noodles over, add bean sprouts, chives and fish balls. Increase the heat, stir for a couple of minutes and dish out.